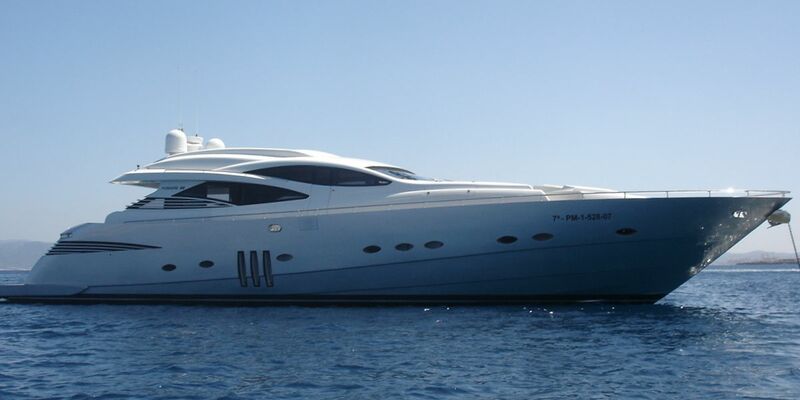 Built by Pershing in 2007, 28m/90ft open yacht SANDOZ is a fast planing superyacht constructed from a composite hull and superstructure. 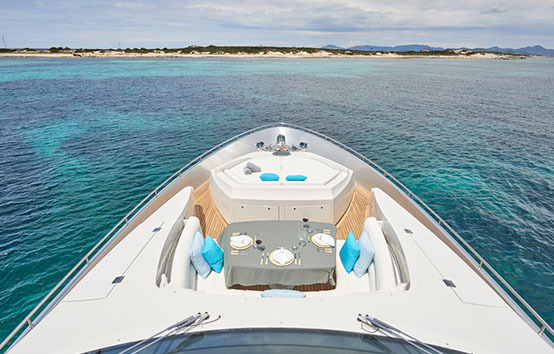 Her naval architecture and interior styling come from Fulvio Di Simoni for a cohesive appearance inside and out. 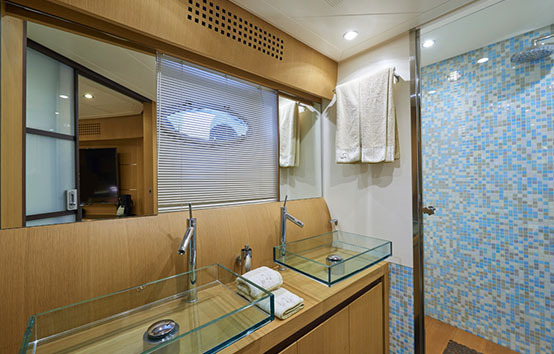 The spacious guest accommodation sleeps up to eight over four en-suite cabins, with a crew of three to take care of details. 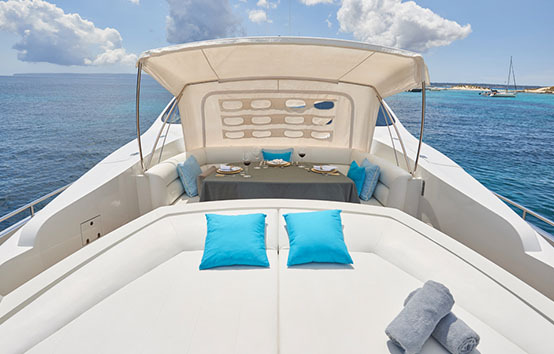 The sizeable swim platform provides a large space for guests to unwind close to the water, and after a swim, guests can dry off on the main deck aft sun pads before enjoying a hearty meal at the triangular alfresco dining table designed to seat five guests with uninterrupted views out across the stern. 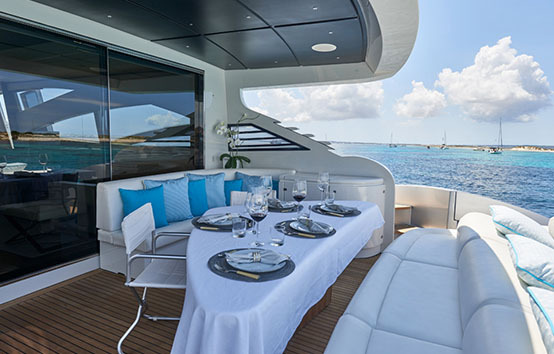 The foredeck also offers an abundance of sun pads as well as a forward dining area that can be shaded as guests desire. 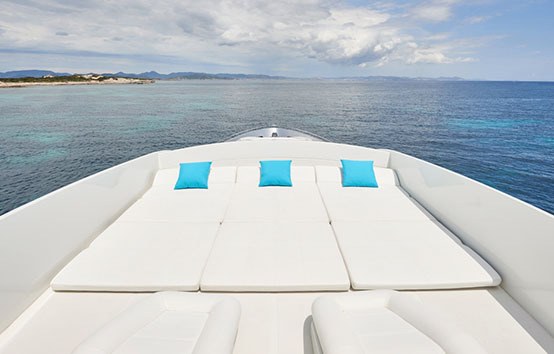 More sun pads are available on the flybridge, allowing a group of eight to spread out and enjoy some peace and quiet in the sunshine. 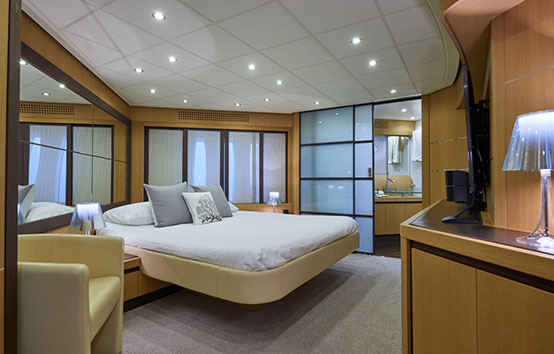 The lower deck contains the stern tender garage, the aft crew accommodation and the guest accommodation which consists of a Master suite, two twin cabins and a VIP stateroom, all with TV entertainment and en-suite facilities. 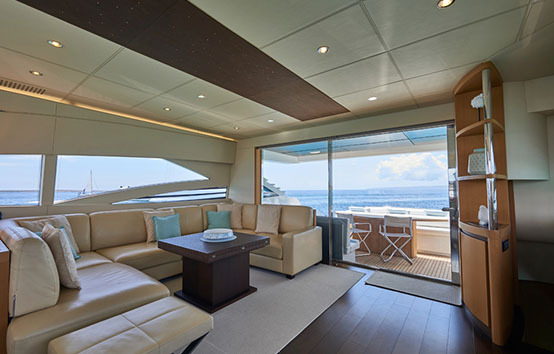 On the main deck, an abundance of windows ensures that the modern and minimalist interior receives plenty of natural light while providing excellent views of the local sights. 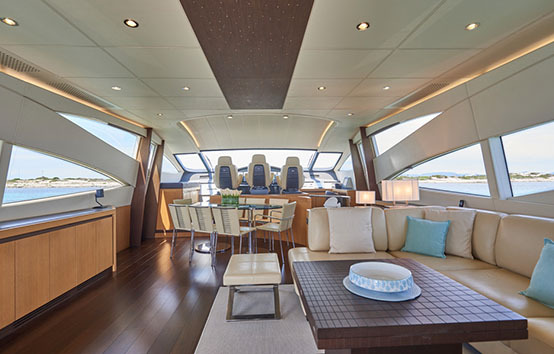 The large open-plan interior places an oval formal dining table that seats eight behind the helm station and a C-shaped sofa is placed around a coffee table on the starboard side, leaving the port side free for TV entertainment in the cabinetry. 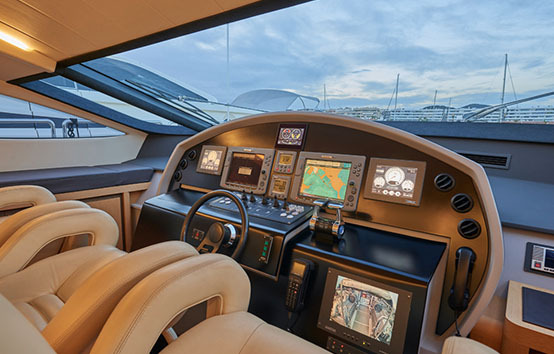 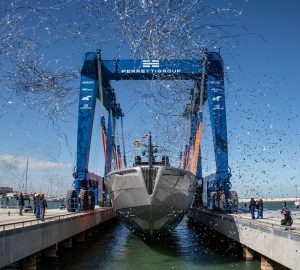 A pair of MTU 16V diesel engines produces a cruising speed of 30 knots and an impressive top speed of 44 knots with a range of 445 nautical miles at an economical speed. 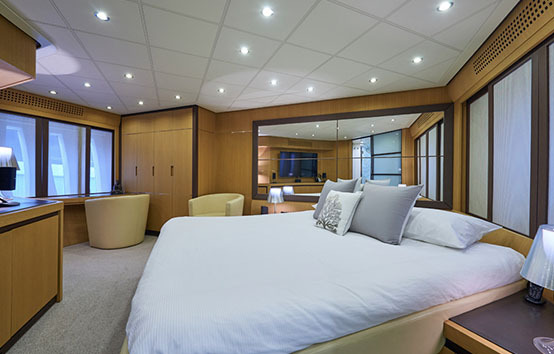 The accommodation provides for up to 8 guests with 4 sizeable modern en-suite cabins: 1 Master suite, 1 VIP stateroom and 2 twin cabins. 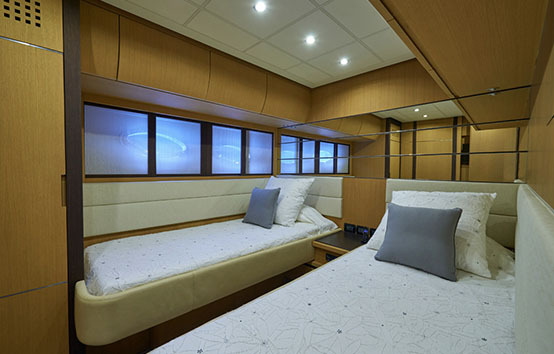 The crew accommodation sleeps 3.